To submit a donation request, fill out the form below. Donation requests are considered monthly. Requests are due by the 7th of the month before the donation is needed. See below for a full schedule of deadlines. 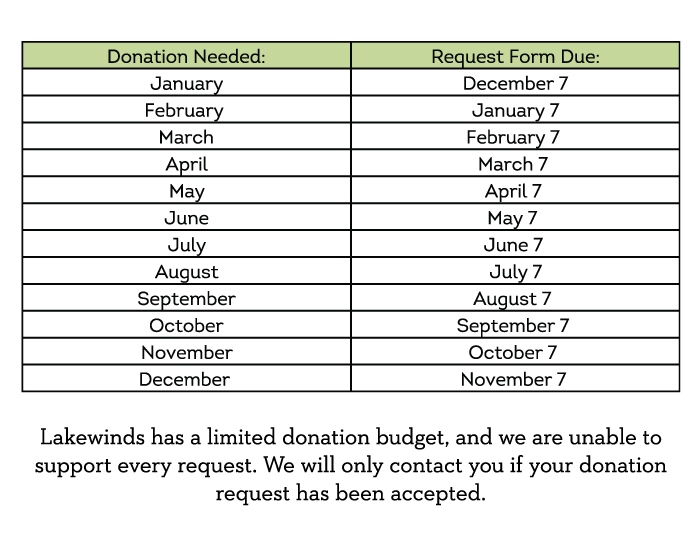 Lakewinds has a limited donation budget, and we are unable to support every request. If you have any questions about your event or donation, please email us at marketing@lakewinds.coop. Note: In the interest of sustainability, we are no longer accepting printed donation requests at our stores or business office. All donation requests must be submitted electronically through this website. If you are looking for a larger contribution for your organization, our customers support our monthly Round Up program by rounding up their grocery total to the next dollar. Learn more about our Community Giving Round Up Program. Address where a donation, if mailed, will be sent.